Find tramp in plastic, rubber and recycled materials. 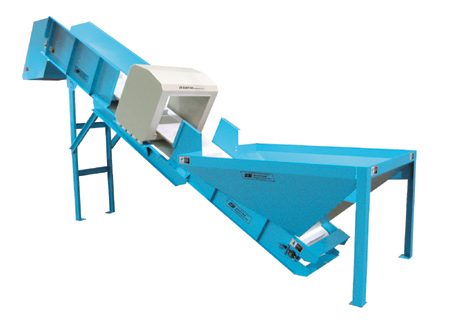 Our Grinder/Shredder Feed Conveyors allow you to catch ferrous and nonferrous metals in recycled plastics before they cause damage to equipment or ruin finished product. This dual-function unit can also be used to monitor plastic parts. The unit combines an option-rich conveyor with a compliment of one of three optional metal detectors that can sense all conductive metals. All three available metal detectors feature a triple-coil, high-frequency metal detection system. Works with grinders and shredders or to inspect finished parts. 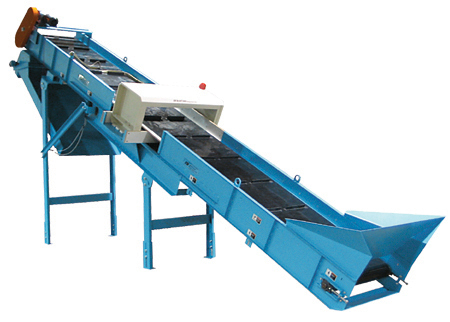 Images show conveyors with side guards removed to show design of metal detectors.